Nadal and Federer (above), after Nadal saved 2 match points to defeat Roger in Rome in 2006, in their only 5 set match on clay to date. Federer was 92-5 that year, in one of the most dominant single seasons in tennis history. Serena leads the h2h 11-2, is 1-0 on clay (Madrid, F, 2012, 6-1, 6-3), and has never lost a set to Vica on a specialty surface/soft court (grass + clay = 4 easy wins in 8 easy sets). Obviously that is the knock on Azarenka, who is vulnerable to drop shots and balls that go back behind her, things she is not vulnerable to on hardcourts. Nadal leads the h2h 19-10. We’d give Roger more of a shot here than Vica, as again, it’s not often to see such a huge plus by either name, but we are expecting both favorites will come through. 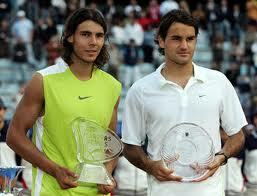 If Fed is going to beat Rafa on clay this year, he should try to save it for RG. One handed heir apparent, Grigor Dimitrov (above), about to cut a deadly slice from beyond the tram line on Tuesday. In October of 2012, world #1 Novak Djokovic came upon talented upstart Grigor Dimitrov in an early round match at Shanghai, on a liberal hardcourt (where Djokovic is hands down the best in the business, despite losing the 2012 USO final to Andy Murray), and made short work of the lad, then ranked around 50-something in the world. It went to the king, 6-2, 6-3, over the squire, but the kid played better than the score line indicated. As you may know, we’ve had Dimitrov marked as prime stock since his junior days, and whenever we are asked who will carry the mantel as the next great one hander, we say Grigor Dimitrov. Even at 18 and 19 years old, rarely has the kid stepped on the court and not flashed the brilliant potential we associate with him. Dimitrov is in a class of comers, with Milos Raonic (who made for one half of an interesting if unsuccessful doubles pairing here with Dimitrov this week, coincidentally) who you know we love, and Jerzy Janowicz, who has an electric game and a fluid serve motion reminiscent of the king of swing himself, Pete Sampras. We’ve taken to Raonic and Janowicz because they play the game on their toes, and their countenance is aggressive. But with Dimitrov’s arrival, we find it not only refreshing but proper and rightful to see a one hander compete at the highest level in this era, and one who we think is destined to win majors. If Janowicz and Raonic and their big time serves are the new kings of swing, then we’d like to anoint Dimitrov as the new king on the backhand wing. His Tuesday tussle with Novak Djokovic would be an excellent barometer of the kid’s flat out superb skills on that wing, as Djokovic has the best backhand in the sport, but could not take Dimitrov in BH to BH rallies– on clay–which is extremely notable, since the higher bounces favor 2-handers. We thought that Djokovic was far more impressive off the forehand side, and dictated play much better with the forehand, which has improved so much, along with his heart and grit, as he has ascended into the stratosphere with his game. Good news for Dimitrov, especially since he does not have an imposing forehand. That wing will need to improve dramatically in order for him to one day claim the top spot, which we think he is destined to do. As for the grit and heart, he already has it. Despite serious cramping, Dimitrov bucked up late in the 2nd set on Tuesday, and found his way to match point, though he had a 10 or so minute stretch during which he could barely move. We must also note that Djokovic was more or less good to go, after 2 weeks of rest that followed his spanking of Rafael Nadal at the MMC, handing the Spaniard what was only his 3rd loss ever on French clay (counting MMC and Roland Garros). We had our own questions about Djokovic’s ankle going into the MMC, but after his fine form and 2 weeks recovery, there are zero questions that still persist. Now if Djokovic, the former king of quit, and by our count, the only top player to retire at 3 of the 4 majors, could learn to turn that weakness into a strength, then so too can Dimitrov with the forehand, which, after all, is a tennis shot. Especially in the case of a Dimitrov, as we do not really usually assume improvement, and when we do, we don’t do it lightly. We never assumed James Blake was going to have his big break through, and we even knew he’d still lose that match to Agassi in the QF’s at the USO in 2005 when he was up 2 sets and on fire. Good thing we didn’t assume greatness for Blake, because if we had, we’d still be waiting. Dimitrov however is a rare breed. This no Bernard Tomic. This kid gets up to play matches, comes with a plan, and believes he can win. Even if the plan seems rather lacking in sense, like going backhand to backhand with Djokovic on slow dirt. Or believing he could play with Rafael Nadal, as an 18 yr old at AMRO in Rotterdam, and playing him closely in a 7-5, 3-6, 6-3 loss in which he was not afraid to go after Nadal’s (who was then #1) forehand, which most players are terrified to do. On that note, we have a bone to pick with Milos Raonic, who repeatedly approached the Nadal backhand at the MMC and got burned, winning 3 of the 1st 4 games and then losing 11 of the last 12. We aren’t gonna say Raonic’s development has stalled or taken a hit, as talent needs to develop and breathe and can not usually be measured strictly week to week. That’s why we are measuring these 2 against top talent instead. Raonic’s gameplan was flawed, and we felt, lazy. A Spanish team (Raonic coach Galo Blanco who we usually have high praise for) should understand that tall players that go after Nadal’s forehand, in rallies or on the approach, are having success, since they deal well with the high strike zone and have the power to do something with his topspin, whereas giving Nadal a target on the backhand, which he can direct with the top hand, is really the only backhand he hits for winners–passing shots. To that end, Raonic also quit on that match, and had we paid to see it, we’d have been very angry. The listless play bordered on lack of sportsmanship. By the way, Raonic was abysmal on 2nd serve that day, which we also could not understand so well, since Raonic gets so much action on his 2nd ball and since Nadal returns serve from so well beyond the BL. We totally agree with the call, “this is magnificent!”, which comes at 11:29 of the video when Dimitrov hits the particular down the line backhand that we already described above. Now if you still are over there questioning Dimitrov’s ability to improve, just consider how strong his serve has become. Djokovic, for our money, is by far the best returner in the game. Dimitrov aced him 13 times on slow clay, and held his nerve on several critical 2nd balls placed deep in the box, a skill that Milos Raonic has lost track of. Dimitrov won 63% of all his service points, 52% on 2nds, and saved 10/12 BP’s. If his serve can get to that level on clay, then his forehand can go a lot farther, as top dogs like Djokovic’s and Azarenka’s has. Elite class players are always developing their game (recall Federer adding the forehand dropper), and right now Dimitrov is pre-prime, though still poised to move from #28 into the top twenty with nice showings in the coming weeks, already up more than 20 spots now than where he was at the end of 2012. Dimitrov should also expect his best results come the fast court legs of the tour on grass and American hards (as a junior, Dimitrov won Junior Wimbledon, the Junior USO, and the Orange Bowl). The obvious comparisons, from hairstyle to sponsor to the one handed backhand is Roger Federer, and that they were both coached at the junior level by Peter Lundgren doesn’t diminish the comparisons, though Dimitrov seems to learn from all his coaches, which have also included Serena’s coach Patrick Mouratoglou and current coach Michael Tillstrom. We think the Federer comparison weak stylistically if not substantively. Federer is a forehand player and Dimitrov is a backhand player. 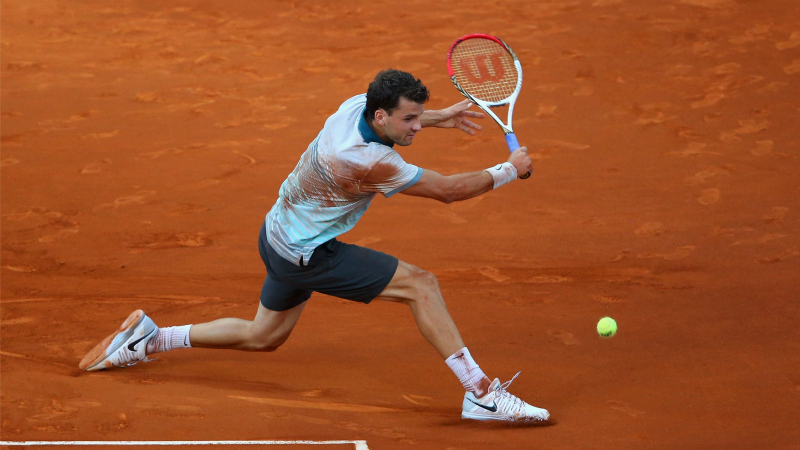 Dimitrov does not manipulate backhands into inside out forehands. He doesn’t have to. But we think he will be able to in time. When he does, look out. This kid is marked for greatness the same way Roger was, which might be their greatest commonality. That, and his ability to put points together, which might even be a stronger skill set than Roger’s, especially pre-prime, have us very high on one handed tennis again, which as any purist understands, is the most dynamic and talent affirming style there is, and which is noticeably absent from the game these days due to the game’s over-homogenization at the hands of safe baseliners, safe baseline coaching, clay, slow hardcourts, and thick grass. Yes, that is Dimitrov with “serious girlfriend” and career slam champion Maria Sharapova. An old shot of the main man, Novak Djokovic (still in Tacchini), with Canadians Vasek Pospisil (l.) and Milos Raonic (still with Lacoste)–future main man–and former King of Clay Rafael Nadal. Anybody catch the beat down Rafael Nadal caught at the hands of the real king, Novak Djokovic in Monte Carlo on Sunday? Good of Nole to give Rafa a sorry little game in that first set, wethinks, prior to taking the 2nd set breaker with ease, on his way to his first ever Rolex MMC shield, and doling out Rafa’s first loss there since Guillermo Coria got him in 2003. Now we had our concerns about Djokovic. Not about his tennis, and not about dirt, but rather, about the ankle, which he seemed to roll very badly against Sam Q in DC, but of course, not badly enough. For Querrey. Or Nadal. 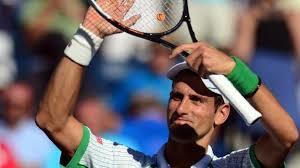 Such a treat to see a guy mature mentally from quitter to hitter, which is what Djokovic has done. Bravo. And like a smart athlete, this week he rests. Then there’s Nadal. Couldn’t play for so so long, and now, he’s back to playing more meaningless 500’s, and one sandwiched between the MMC and the Italian Championships. Can’t teach a dumb dog…um, old dog, sorry, new tricks. Since Nadal jumped back to the scene, it would seem he has played more matches than anyone else in the game, and almost leads the game in match play, despite missing the Aussie swing. Interesting indeed. But not curious. Nadal leads the h2h 2 love and Raonic has yet to take a set. But but but. I think a lot of people (or maybe it’s just Patrick Edwards, LOL, can’t say as too many people other than our good friend PE actually care) may confuse our picks for who we think is going to win, when what we are doing is discussing good bets. Like in Miami, we told you that Murray was a bad bet against Ferrer, and if you had plunked down 400 units to win 100 on Murray, you must have been dying at match point Ferrer, no? Murray is a pick em over Ferrer, even on hards where Murray makes his home base. This isn’t football. Murray is not good enough to give a touchdown, or rather, in football terms, 8.5 points to Ferrer. Nadal is a bad bet today by those terms. And he’ll probably win, but would you like to lay 100 units to win 6.67 units? That is just insane. Then there’s the matter of Raonic being a lot better on clay than people think, the bit about him having Spaniard clay court specialist Galo Blanco as his coach, and that his home base is also the dirt yards of Spain. Raonic is 6’6. He can dunk basketballs like JR Smith at TD Gardens!!! High bounces do not bother him, which are Nadal’s bread and butter. We’d take a flyer on Raonic here, laying 100 units to recoup 900 should the wunderkind come through. Now if only the rain stops so we can see the show. 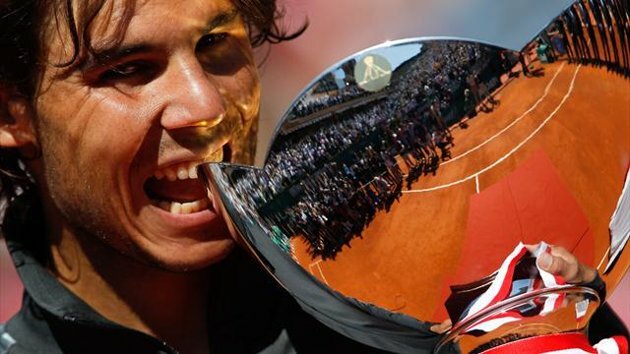 Rafael Nadal (above) seeks his 9th Monte Carlo Masters 1000 shield 10 hours from now. Nadal leads the h2h 19-14, and has grabbed 13 of 14 on clay in the matchup, and the last 3, including the “hotly” contested 2012 final at Roland Garros at which Rafa cried and whined about having to play in a little rain (since he was getting pounded during that stretch). We don’t see these odds as Vegas being that into Rafa here, despite the whole slow red clay story. Nadal has won the previous matchup at the MC, back in 2009, going 3 sets. Not sure if Nadal has ever lost at MC in fact, and not he shouldn’t be the bigger favorite here. Djokovic is a wilting lily no more. He and Azarenka both had the trait, and as they matured, they have both developed extreme toughness. We’d like to commend him on that now, and Azarenka, we’ll save for later. It is very hard for an athlete to change their personality, and in tennis, the turnaround is so stark, especially with Djokovic, that we would have to harken back to Andre Agassi, to think of a similar mentality change. And Agassi won at RG late in the game, after his attitude adjustment. We see Djokovic getting his RG trophy a lot earlier than Agassi did, and we were thinking this year. So we were of course very disappointed to see Djokovic hurt his ankle so badly in DC versus Sam Querrey. It may not seem to affect him, and he has won 6 straight matches since rolling the ankle, but he will need his wheels today. Djokovic wants it badly, for sure, and usually, we’d take a flyer on him, even in this situation on clay versus Nadal. There are probably those of the mind that if he is playing, then he’s fine. And certainly, the ankle did not slow the main man down against Sam Querrey, breaking Querrey in his first game after the injury, and getting stronger as the match went on to boot, allowing Sam Q only 1 of the last 13 games. But we think Djokovic should get himself absolutely perfect for RG, and we don’t see how war of attrition tennis versus Nadal 5 weeks before Paris helps him to do that, unless Djokovic is so there mentally that he has completely blocked the injury out of his mind, and is looking to make a statement here versus Nadal, who we don’t think has played that great here, playing very close matches with Grigor Dimitrov, who split 158 points with Nadal evenly, and with Tsonga, who usually has no traction at all against Rafa on clay (6-3, 7-6 is very close for Tsonga, LOL). We’d like to see Djoker at his best on that first Sunday in June, but there have been whispers that he may lose his ranking during the clay season if he takes his foot off the gas. We will trust the decision to the Djokovic camp, who has been making all the right moves since jettisoning Todd Moron, um, Martin, sorry. One thing we can not stand though, is to see a hurt player making an extended go of it. See Angelique Kerber’s brutal play these last few months. Health comes from rest and treatment. All that said, this will be compelling tennis for a variety of reasons. Gun to our head though, we’d probably take Rafa, pained as we are to admit. Serena Williams (R.) with her much lesser rival, Maria Sharapova. Note: these odds have shifted exactly half a dollar (or fifty units on a 100 unit play) since last night, when Serena was – 340. Sharapova opened at +240, so obviously, the late money has been on Sharapova, which has corrupted this line. Las Vegas must be thrilled with this development, as Sharapova has virtually no chance to defeat Serena, based on recent history, and yet, the wagering on Sharapova has stimulated a movement in her direction. Anything can happen, of course, but if you are placing your money on Maria Sharapova today, you best have some inside information. In looking at the h2h, Serena leads 13-2 and has not lost to Masha since 2004. Almost a clean decade. Sharapova has not taken so much as a set in 5 years (Charleston, 2008). We think Serena is an enormous bargain here at -290, -320, -340, etc. Serena is fit, and she is a far superior player who takes Sharapova’s time away. Watching Serena dominate Radwanska the other night, who played Serena very well at Wimbledon, and barely allow her to get a game does not bode well for the Russian, since in a similar circumstance to Radwanska, at the London games, Sharapova was bagel bread sticked. This is probably going to be ugly. 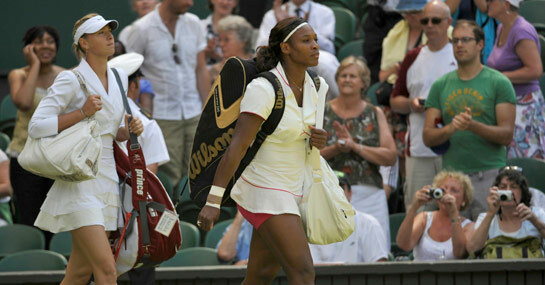 Serena is looking for 6th title here, while Sharapova is 0-5 in finals played at Cramden, Stadium Court. Murray is a great player, obviously, and the surface suits him, as does the locale. But enough about Murray and South Beach and that “great love affair.” The h2h is 6-5 in favor of Murray, and Ferrer has taken 2 of the last 3, and the last matchup on hards, in 2011. Murray will probably win, but not a lot separates these 2. And Ferrer is an absolute pit bull, and will be really gunning for Murray in this spot. This line is out of whack. We’d take Ferrer at these prices. In the h2h’s, Rafa leads DP 7-3 and Masha leads 4-2.